Despite making the apricot and ginger muffins and snacking on the apricots I still had some left by the end of the week and I knew exactly what I wanted to use them in. Not too long ago I came across a post titled ‘White Chocolate Apricot and Macadamia Nut Blondies’ on Chef Wannabe and I thought to myself, Blondies would be good with white chocolate and dried apricots. Then I scrolled down a bit and saw that they in fact used fresh apricots and I was immediately sold. 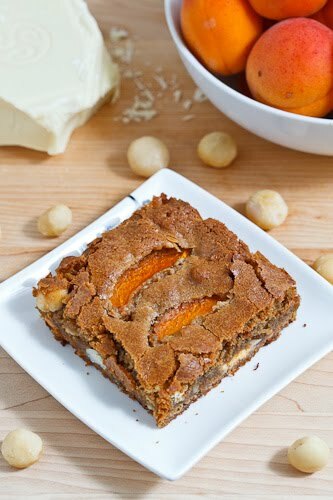 The sliced fresh apricots had worked so well in the muffins and I knew that they would be amazing in blondies! Blondie recipes are really easy with the base recipe consisting of butter, sugar, eggs and flour. Don’t let that fool you though as blondies, like brownies, have that melt in you mouth texture that is like a cross between a moist cake and fudge. From there you can add pretty much any flavours that you want and the apricot, white chocolate and macadamia nut flavour combination in these blondies is definitely a winner! My mind is just racing with the possibilities now. How about fresh blueberry and pecan blondies next? Note: These blondies turned out a little dark because I use a dark brown sugar but you can use a lighter brown sugar or even white sugar if you prefer a lighter colour to your blondies. Beat in the eggs one at a time and continue beating until fluffy. Mix the flour in followed by the nuts and chocolate. Pour the batter into a greased 8 inch square baking pan. Bake in a preheated 350F/180C oven until a toothpick pushed into the center comes out clean, about 30-40 minutes. Çok şık ve leziz olmuş ellerinize sağlık. Your work is always so professional and delicious. You are really a very creative person. Oh my! These sound just perfect! A splendid combination! What refined flavors! The idea of adding fruit to Blondies is inspired. I am on an apricot kick yet. When I get my fill of eating them fresh (such a rare event here), I shall bake with them! Well, I guess a trip to the store for apricots is in order. fantastic shot kevin!looks really delish too! apricot and white chocolate sounds like…best friends! I actually love blondies infinitely more than brownies…and white chocolate better than dark chocolate! Hello beautiful! What a different take on blondies. How delicious!!!! I simply love blondies and haven't had them in ages … the white chocolate and macadamias put them over the top. I must confess … after 5lbs of apricots in my CSA each week, I am a bit tired of apricots though! Wow, these look incredible. Do you think the recipe would still work if I used nectarines? I have an overflow, and they are still quite firm. Love your recipes, btw. I've tried many. Your chocolate-zucchini bread has become a household staple. Kevin this is such a great treat. I'm sure I would love it. Wow, I thought I was going to make some peanut butter blondies tomorrow on my day off, but I think yours won me over…now I hope I have everything! I heart blondies. More than brownies! Thanks for the recipe. Gorgeous! Look so nice and yummy. You are basically my new favorite person. I loved these! Those look awesome! I just made some brown butter white chocolate macadamia nut cookies today that probably would have been great with some apricot thrown in too! For me you’re Apricot White Chocolate and Macadamia Nut Blondies is one of the best that I taste. I am still thinking what makes is so yummy. Madame Fromage: Nectarines should also work well! I am worried about making these because I think we would eat them all in one sitting. I love blondies for that reason – they are so much lighter than brownies! I also really enjoyed your white chocolate green tea mascarpone brownies! Thanks for adding the extra links. Your recipes are so creative. I would love to chat with you at IFBC about how you come up with new recipes. Enjoy the rest of your apricots! These are gorgeous…love how the apricot peeks out of the top. I love that these use apricots – seasonal summer fruit! I will have to try these… thanks! oh my word, Kevin – that's so good it's evil! 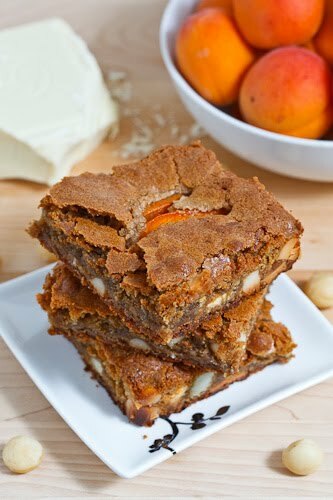 I have a weakness for apricots, macadamias and brownies – to combine the three is just pleasure overload. Wonderful! Anonymous: Strange… What kind of a baking dish were you using and how deep was the batter in the dish? They should be around 1.2-3.4 inch thick. The side will get a little crusty, but in a good way. Would love to sink my teeth into these! The slighty sour apricots must taste wonderful with the sweetness of the other ingredients. This is totally perfect! I love the color and the combination of flavors!